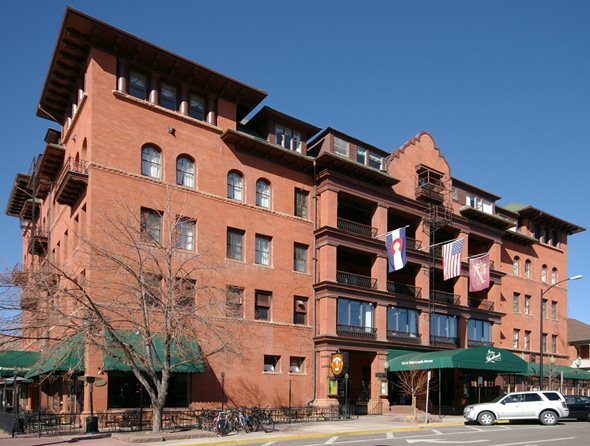 The Hotel Boulderado, a century old, got its name from combining Boulder and Colorado so guests would always remember where they’d stayed. The hotel was built for $131,664.73, from $100 subscriptions from local business owners. It opened on New Year’s Day 1909, with rooms from a dollar a day, or $2.50 per day with meals. The bedrooms had light fixtures that ran on gas and electricity and most of the 75 original rooms had telephones. Early guests included President Teddy Roosevelt, the poet Robert Frost, the author Helen Keller and jazz trumpter Louis Armstrong. The hotel’s architecture combines Italian Renaissance and Spanish revival. It is a National Register Landmark and a member of the National Trust’s Historic Hotels of America. Following an addition that carefully continues the Victorian style, the downtown landmark now has 160 rooms for guests and is the site of many meetings, weddings and other special events. A two-story Christmas tree makes the lobby a festive draw in December.